HOUSTON — After James Harden scored 61 more points Friday night to match his career high, Mike D'Antoni was asked the question just about everyone in the NBA is wondering this season. "Be aggressive," Harden said. "We were down so we had to make shots and get stops." 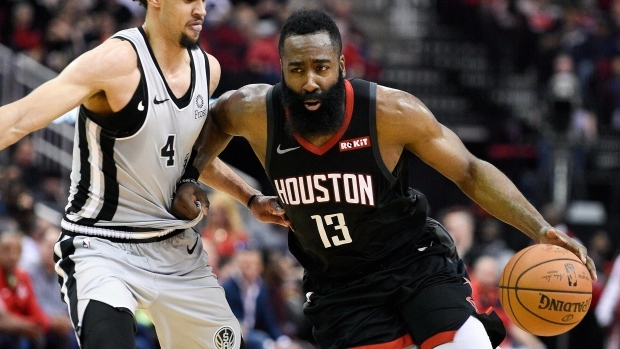 "I just knew how important this game was," Harden said. "This was an opportunity for us to take care of our home so I wanted to come out with some aggressiveness." "You've got to appreciate it," Rockets point guard Chris Paul said of Harden's run this season. "What he's doing, that ain't easy. I don't care who you are." "He's been in the zone all year with the things he's been doing," DeRozan said. "He's been remarkable. You've got to tip your hats to him. When a guy gets going like that, it's tough to slow him down." "We gave up a million points in the first quarter, they had 19 free throws in the first half and none in the third quarter," Spurs coach Gregg Popovich said. "You play with your heart but you play between the ears, also, so we played smarter and harder in the second half, but you can't do that against a good team like Houston or any team in the NBA. Spurs: Davis Bertans' recent struggles from beyond the arc continued. Bertans entered March shooting 46.9 per cent from 3 on the season but after going 1 for 10 on Friday is shooting 30.3 per cent this month. ... The Spurs outscored the Rockets 56-36 in the paint. Rockets forward P.J. Tucker went scoreless and 0 for 3 from the 3-point line but had 10 rebounds, two assists and two blocks. He was frequently tasked with guarding Spurs power forward LaMarcus Aldridge, his former teammate at Texas, who scored 10 points on 5-of-13 shooting. The Toyota Center crowd cheered loudly when the Rockets announced an 84-55 win for the University of Houston men's basketball team over Georgia State in the first round of the NCAA Tournament. Rockets owner Tilman Fertitta, a Houston alum who helped fund a renovated arena for Houston in 2016 at the renamed Fertitta Center, sat courtside at the Rockets game.